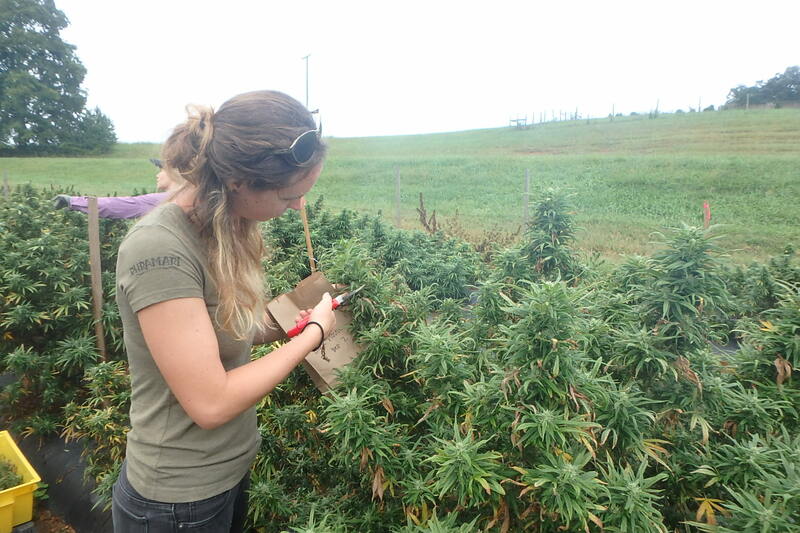 Harvesting floral parts from industrial hemp research trial in Mills River, NC. The interest in industrial hemp production in the Carolinas is very high. The number of inquiries we get in our program is more than we can answer in a reasonable amount of time. So, if you are interested in learning more about growing industrial hemp in North or South Carolina and can spend the afternoon in Durham, NC on Friday, November 9, 2018, I encourage you to attend the workshop we will be holding at the Sheraton Imperial Hotel from 1 to 5 p.m. This is a pre-conference workshop before the Sustainable Agriculture Conference that starts that evening and runs all weekend. Pre registration is closed, but you can show up and register on site. Here is a link to the website for the conference. There you will find details on the pre-conference workshops, registration, costs, etc. : Sustainable Agriculture Conference. Speakers in the session will include researchers and Extension personnel from NC State University and Clemson University, growers, and industry experts. Topics covered will include the rules and regs, research results, testing for CBD and THC, and grower experiences (field, greenhouse, indoor grow, for floral parts, grain and fiber). There will also be time for questions and answers.